It was another great evening of collective performances in the name of relays inside the Al B. Carius Field House on the campus of North Central College. The fast-paced event featured three relays: 4x800, 4x200, and 4x400. The officiating was just as quick as the athletes by ensuring that the start of each race moved at a methodical tempo. The first race began at 6:30p sharp and the final event was in the books at approximately 9:33p. As usual, the damage done to the leaderboards was massive. There were 34 total new entries collectively to the top 10. 4x800: The third section or "championship section" was set up by section 2 winner Geneva who clocked 8:14.43. The opening pace of the second race was not that fast, to be honest. Burlington Central's lead man went out in 57-seconds before the pack caught up. Minooka lead man Jason Hoffman, who with an unorthodox running style, wormed his way into the lead and first exchange at 1:58.5. The pre-meet favorite Naperville Central got the lead near the tail end of the second leg and never looked back. Anchor Thomas Shilgalis cruised with a 1:58.8 leg and his team prevailed in a new state-leading 7:57.92. Glenbard West fought strong and held on to second in 8:01.49. St. Charles East was third in 8:01.84. 9 of the 10 finishers placed inside the top 10 overall leaderboard. 4x200: There were just two new entries for the top 10, but the entertainment value was a 10/10. It did not take long for the madness to begin and when the data was collected, there were three disqualifications and one dropped baton by a runner who near the finish line of a race. One such mishap was not called by officials between Plainfield East and Minooka that prevented the latter from vying for a first-place medal. Plainfield East's third runner handed off to his team and blocked the outgoing Indian leg. The end result was a 5th place for PE and Minooka 6th. The final sixth section saw Plainfield South run four solid legs and surprise the field with an IL #6 1:32.91. 4x400: The final race of the day did not appear to exhaust the fans who remained. Things began to heat up after section 3 when the winning times dipped below 3:35. The final race of the day saw a see-saw battle between several schools. But it was Minooka and Lockport battling for the trophy. Minooka's strong leg by Hoffman provided the thrill of victory in 3:28.74. 4x800: Coming into the event, the talk was how far under the meet record that Downers Grove South would run. The Mustangs were the clear favorite with junior Erin Reidy and her recent sizzling and state leading 800m (2:11.47), As it turned out things would not be a cakewalk. The Mustangs had to fight on several different fronts as interference to their plans got in the way. One such barrier was freshman Katrina Schlenker of Batavia opening a huge gap on the field with a second leg carry of 2:14.6. The Bulldogs would latch on to the lead until the anchor leg. It was essentially over then as Reidy cut into the small deficit with ease and later pulled away with a 2:15 split. The final result was a meet record 9:20.49. The top four placers and eight of ten came from the "championship section." 4x200: Billed as an afterthought because several of the state's superpower teams were not in attendance. However, after Prospect won section three of six in 1:48.59, there was a sense of some very fast times on the horizon. Sure enough, the final section provided some fireworks. Lincoln-Way East was headed for victory until West Aurora star Dajour Miles heroics snatched the victory from jaws of defeat. The one they call Cinnamon blazed around the track and just like that pulled off the "kick of the week!" The winning time was an IL #2 1:44.81. Lincoln-Way East walked away with a nice consolation prize 1:44.90. 4x400: Six sections and each one got progressively faster than the previous one. The final showstopper of the day was just as dramatic. Once again West Aurora vs. pitted against Lincoln-Way East. And once again it was Cinnamon coming from behind to provide the entertainment. Inside of taking a commanding lead against Taylor Wright, Miles sat on her for until the final 50m and brought home the win in 4:05.25. It would be the third best time in the state. One wonders if Miles, the state leader in the 400m, had ran her customary frontrunning style, the Blackhawks might have went under 4:00. As it were she split 60.0. The feeling of pressure builds up in a cloud that envelops determined runners as they hover precariously on the white curved line awaiting the powerful burst of the gun. Once blown, the pressure cloud shatters, and the nervous emotion transforms into heartfelt fierceness. This confident focus must hold strong during the speedy laps that follow take-off to successfully get oneself into position for a seamless hand-off at Downers Grove South's Mustang Relays. With teams such as Yorkville, Downers Grove South, Batavia, and Minooka (add or take out teams here) partaking, competition is high, and teams must perform at an enhanced level. There's no doubt that Mustang Relays is one of the indoor meets athletes look forward to year after year. Taking place at the Merner Field House on North Central College's campus, the meet quality is satisfactory. The 200-meter track on the lower level proves to be an excellent surface to run fast times, and although the upper track gets a bit crowded, it provides a space for runners to warm up and for spectators to view the races. Moreover, races take place on a strict schedule, which is necessary to keep the meets flowing smoothly without delays. There are numerous heats of each race as well, therefore, ample competition in each section creates an environment for team bests. 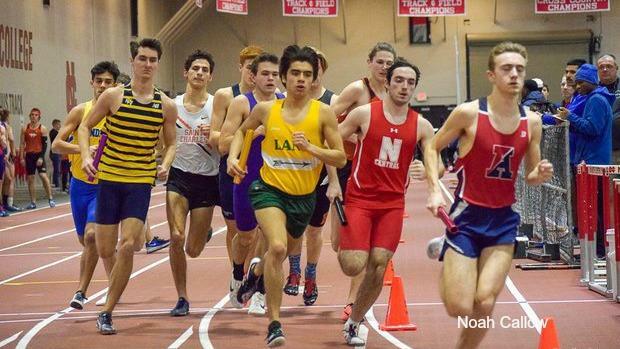 Ben Tholen of Yorkville comments, "It's one of the most exciting meets of the indoor season. Every heat is competitive, and everyone has the opportunity to give it their all." With 6 total heats of the 4x800, 12 of the 4x200, and 12 of the 4x400, numerous athletes have the opportunity to run personal bests. In addition to the multiple competitive heats, the atmosphere of the meet contributes to the high level of running as well. The indoor stadium is filled with the cheering of both fans and teammates alike, while upbeat music develops the hyped character of the meet as well. Sara Klemm also of Yorkville says, "The atmosphere is inspiring." She explains how an exciting atmosphere helps athletes maintain their focus and determination throughout his or her race. It is therefore evident that most factors that make up a good race environment are present at Mustang Relays. These factors ultimately contribute to the overall enjoyable experience of the meet which has been bringing teams back for 16 years so far.